MultiBeast requires you to know your motherboard. 1. Navigate to your motherboard manufacturers website, Google search your motherboard model number. Generally the first search result will be the one you want. 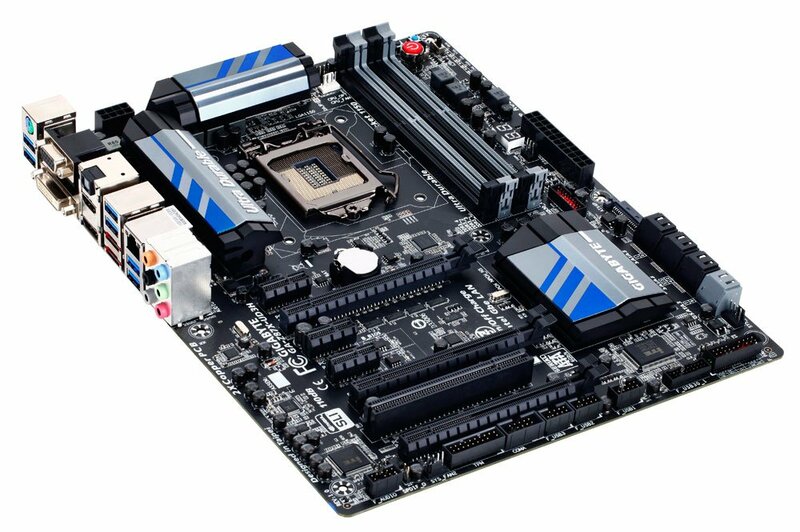 See Gigabyte Motherboards / ASUS Motherboards. 2. Search for the Specification tab to find out which Ethernet and Audio codec your motherboard has (jot these down). 3. If your motherboard has UEFI BIOS, your motherboard doesn't require a DSDT. (DSDT is required for HDMI Audio). 4. User DSDT/DSDT Free Installation must be selected whether you have a DSDT or DSDT Free installation. This will install everything you need to boot from your hard drive. 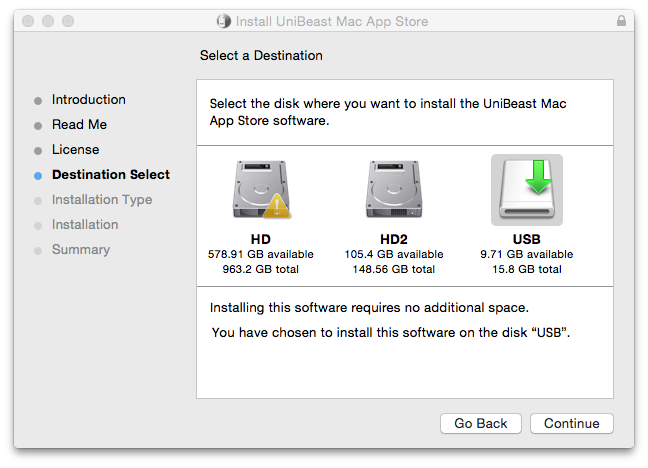 Buyer's Guide require you to navigate in MultiBeast to Customizations/Boot Options/select GraphicsEnabler=No as these are supported natively in OS X. 5a. MultiBeast For Mavericks default is GraphicsEnabler=No and IGPEnabler=Yes(giving the opportunity for both Discrete and Integrated graphics). Recommended selection for IGPEnabler=Yes is Customizations/Boot Options/1080p Display. Note that VGA ports aren't supported by OS X. -sSingle user mode- allows user to access the command line before booting the OS. Same as holding "s" on a Mac at startup. Boots the system using a maximum of 4GB of RAM. Boots the system using a maximum of 8GB of RAM. OS X HDMI audio support for Intel HD3000/HD4000/HD4600, AMD HD5xxx/HD6xxx/HD7xxx/R7/R9, Nvidia 4xx/5xx/6xx/7xx, Intel/AMD and Intel/Nvidia graphics configurations. 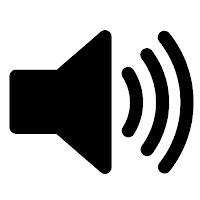 This guide provides files and instructions for enabling native OS X AppleHDA HDMI audio. HDMI audio dsdt/ssdt solutions support Yosemite, Mavericks, and Mountain Lion installations. Today Apple released 10.10.1, the first major update to OS X Yosemite. Update any supported system using the built-in Software Update functionality through the Mac App Store, or by using the standalone installer available from Apple.com. Be sure to back up any important data, and if possible clone your hard drive before applying the update. If you have any issues post-update, boot using UniBeast and type UseKernelCache=No. If you use patched or modified drivers, you will need to re-apply changes to the updated drivers. NVIDIA Alternate Graphics Drivers have been updated for 10.10.1. This update will replace your audio drivers. X99 kernel and chipset support still absent - Haswell-E and X99 temporary guide remains necessary. Install OS X Yosemite App Updated - If you downloaded Yosemite from the App Store prior to today, and you want to have the latest version on your backup installer USB, simply log into the Mac App Store and click Download. When the download finishes, the app will automatically open. The updated 10.10.1 Install OS X Yosemite App can be found in the Applications folder. 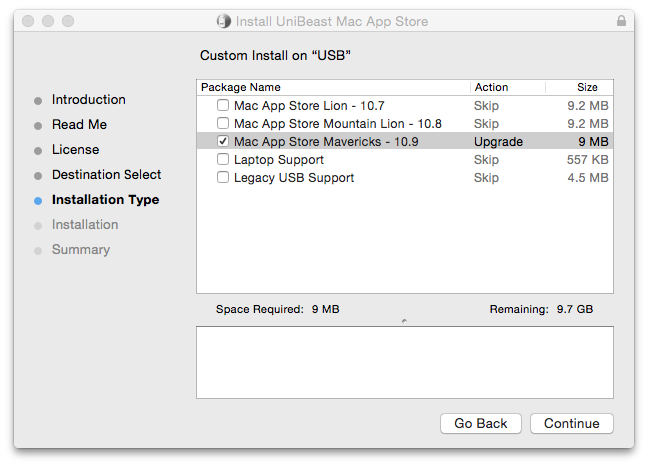 You may then re-create your UniBeast installation USB. Save all of your settings, files, apps, etc... by following this simple guide to upgrade OS X Mavericks to OS X Yosemite. 8. Run MultiBeast 7 and select the following options, and any system-specific Audio and Network drivers. 9. Reboot from drive into OS X Yosemite. Format a 8GB+ USB with GUID partition mapping and name it Install. Insure the OS X Yosemite.app is in your Application folder. In terminal run the following script. This will take several minutes so be patient, the script will notify you when complete. Now Install Clover r2696 (or newer) to the Install USB. Clover r2953 or newer Recommended! choose “with injected kext” to complete the installation. You might try using the HFSPlus-64.efi (Google it) rather than VBoxHfs-64. Also be certain you're booting from a USB 2.0 port. Running a custom version of Ubuntu on your iPhone or iPod Touch may sound crazy but it’s yet another example of the versatile and adaptable nature of Linux as a whole. Now, If your first question to the title above is “Why?” then iX – which brings an XFCE-toting Ubuntu-based distro to the iPhone/iPod touch hardware – probably isn’t for you. But if you were left thinking “No way! Cool!” then read on! To boot iX alongside regular iOS users need to install Open iBoot – and open-source version of Apple’s iBoot that allows Linux to be installed/booted in the iPhone. iX itself is based on Ubuntu 9.10 Karmic and uses XFCE as the default desktop environment. Whilst LXDE would be a much better fit, being both lighter and more resourceful than the comparatively bloated XFCE, it does nevertheless work. Wicd is used for networking, which works, the touchscreen works, but don’t expect multi-touch just yet, however sound is yet to be successfully implemented. You can’t make calls, send texts or tether the device quite yet but given the system as a whole is incredibly slow this is a boon rather than bereft! As it is currently iX is inelegant, it is slow but it is also bloody cool. 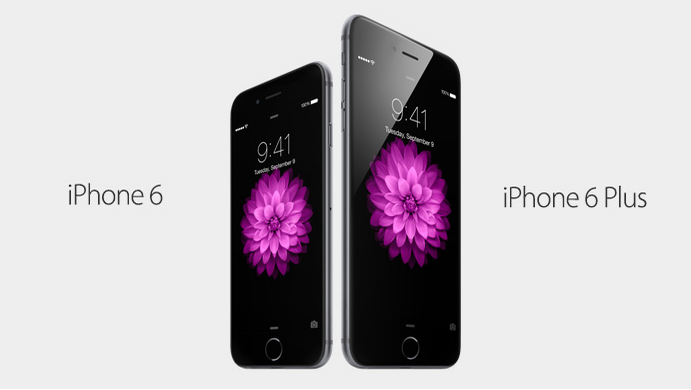 At its special media event today, Apple announced the 4.7-inch iPhone 6 and the 5.5-inch iPhone 6 Plus. Apple is touting a "Retina HD Display" on both phones, as the 4.7-inch iPhone 6 features a 1334 x 750 display at 326 pixels-per-inch while the iPhone 6 Plus features a 1920 x 1080 display at 401 ppi. The iPhone 6 is said to have more than 1 million pixels, while the iPhone 6 Plus is said to have 2 million pixels. The new models feature a number of hardware changes, including a chassis that is 6.9 mm thin for the iPhone 6 and 7.1 mm for the iPhone 6 Plus. Both models feature the next-generation 64-bit A8 chip, which features 2 billion transistors on a 20nm processor. The A8 delivers 25% faster CPU performance and is 13% smaller and 50% more energy efficient when compared to the A7. The device also comes with a next-generation M8 motion coprocessor which can now estimate distance and elevation changes with a new barometer. Apple states that the iPhone 6 will get 50 hours of battery life for audio, 11 hours for video, 11 hours for WiFi browsing and 10 hours for LTE browsing. With its even bigger body, the iPhone 6 Plus will get 80 hours of battery life for audio, 14 hours for video, and 12 hours for Wi-Fi and LTE browsing. The iPhone 6 now also includes Voice Over LTE (VoLTE) technology, including 20 LTE band, as well as 802.11ac Wi-Fi, which delivers 3x faster Wi-Fi and support for Wi-Fi calling. The iPhone 6 and iPhone 6 Plus also support a new camera system with a brand-new 8-megapixel sensor, along with a circular true tone flash. Apple is also touting "Focus Pixel" technology, which allows the lens to move in and out to better determine autofocus points. The camera also features next-gen tone mapping and noise reduction. Apple also says the camera is complimented by a new gyroscope and image stabilization built into the A8 processor. 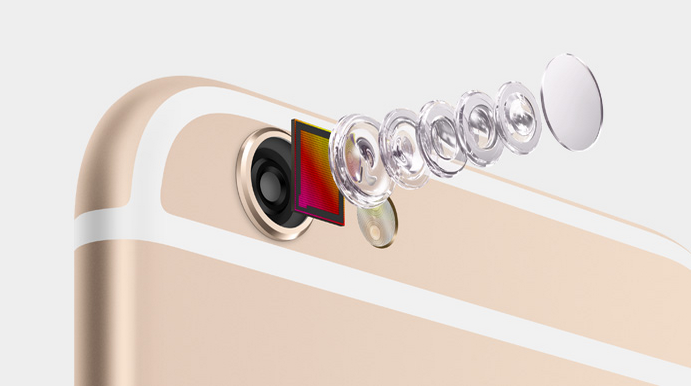 Exclusive to the iPhone 6 Plus is an optical image stabilization system. As for video capabilities, both devices shoot in 1080p at 30fps and 60fps, along with 240fps slo-mo video, which is up from 120fps on the iPhone 5s. The front-facing FaceTime HD camera has also received a new sensor with a f2.2 aperture that lets in 81% more light. Users can also shoot single-shot HDR photos and take HDR video. Both devices will launch on September 19 in the first wave of countries, with pre-orders starting on September 12. Early launches of iPhones can run low on stock, so if you are trying to get one as soon as possible, you should try to pre-order immediately. Pre-orders usually kick off on-line at midnight Pacific Time on the day of. We will report on the exact time as soon as we know. The iPhone 6 will be available in 16 GB, 64 GB, and 128 GB variants for $199, $299, and $399. The iPhone 6 Plus will be available in the same storage capacities for $299, $399, and $499, respectively. Both iPhone 6 models also come in the same Space Gray, Gold, and Silver variants. 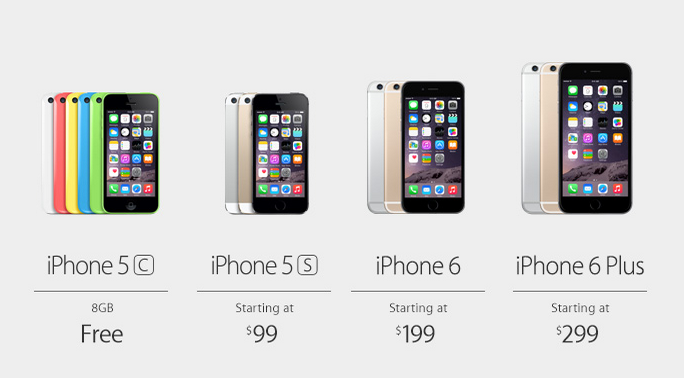 The iPhone 5c is now free on contract while the iPhone 5s will now be offered for $99. The motivation for this build was to make a small up to date system that can sit by the TV. I also was looking for a suitable system to transplant into a Mac Mini case, but that is another story ( Haswell Mac Mini ). I decided to do this user build write up as there are a couple of guides out there to the Haswell NUC, notably the excellent Wonkey Donkey guide and the Clover guide (which is not a full installation guide), but my build went in a slightly different direction that I wanted to detail as a standalone build log. I believe the basic " Standard Installation" steps outlined here are the quickest way to install a fully operational system to the NUC and that the benefits of using Clover on this board also make it a very 'robust" build which is easier to update. The "Fusion Drive" section is of course not a necessary part of the build, but is a standalone upgrade that I decided to do to make use of the drives I have here and of the space available. The method I recommend for this Haswell is a mixed Unibeast and Clover method. You need access to a real Mac or working Hack with the Mavericks Installation Application on it in the Applications folder and a 8 or more GB USB drive. Making sure it is formatted to the GUID partition table in the Options tab. …target it on the USB drive and let it do it’s thing. Use the above settings and then once the EFI volume mounts at the end, open it and go to EFI/EFI/CLOVER and replace the config.plist with the one in my attachments folder. Similarly replace the “kexts” folder with the one attached and the “ACPI” folder. [Note:The config plist will make your Haswell NUC appear to be a MacBookAir 6,2 and the files SSDT and SSDT-1 (credit: Toleda and to Pike R Alpha for the power management SSDT) will configure power management, graphics, HDMI audio and some cosmetic stuff correctly for you. There is also another SSDT-2 in there for the wifi/BT card I referenced in the components list (credit: toleda)]. There is no Kernel patching needed etc as that is all taken care of in the plist. Before finishing your set up, drag your Clover Install package into the USB drive along with the Haswell NUC essentials pack. Then eject the USB stick and go to your NUC. Fire up your NUC and set it to boot from the USB stick. Note: Bios default settings just need a small adjust - make sure Vt-d is UNTICKED in bios and make sure that in the boot configuration screen UEFI booting is ticked AS WELL AS Legacy Booting (this is a small glitch in the NUC UEFI). You should be able to boot from the USB stick straight to the installer. I have set the plist to give “Verbose” output so you will be able to monitor what is happening during boot. Once the graphics of the Mavericks installer appear go to Utilities/Disk Utility to format your chosen internal drive - mSATA or Hard Drive/SSD correctly and name it “Macintosh HD” before returning to the install process and then carry on with the install. Once installation has occurred the NUC will reboot and you can then select your Macintosh HD as the volume to boot. Once your new hack is configured and you are at the desktop then drag the Clover installer and the Haswell NUC essentials pack to the desktop. One final thing now is to configure the audio. If you only want HDMI/DP audio then this should aIready work (because of the patches in the Clover config.plist) and you can stop here. If however you need an analogue output from the headphone jack then you need to install an injector kext as follows. The injection method leaves AppleHDA.kext untouched (well, okay the boot loader patches the internal "binary" on the fly) and uses an injector kext to change values within the kext to suit our codec. To make the injector you will find a folder inside the "Haswell NUC essentials" pack called "PatchingAppleHDA" - inside there I have put a small ReadMe file which explains the simple process. This seems to work excellently and credit for the methodology goes to Pike R Alpha and RehabMan. 2. Carbon Copy Cloner - my favourite backup app for making sure my system always boots. It is a small amount to buy the full version and that is great as it does incremental changes (saving time when cloning) and also has a great Recovery Partition maintenance feature. 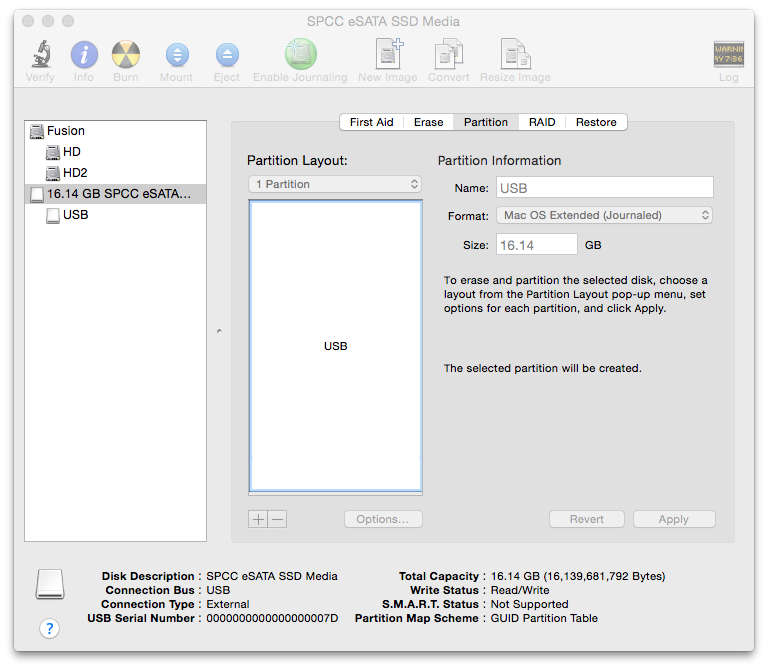 This is a run through of how to make the most of a small mSATA and a cheap larger capacity mechanical drive in the NUC, it takes you through creating a dual boot Fusion Drive and also includes the steps for making an OS X recovery partition. Before starting: I assume you have a working install either on your mSATA or Hard Drive already - I do NOT recommend jumping in straight to Fusion without first having ensured you have a working NUC system. On your working install get the latest Clover revision upgrade and check it is working fine. Then use Carbon Copy Cloner (CCC) to Clone it to a USB Hard Drive. CCC will offer to make a Recovery Partition on the USB drive - DO IT! 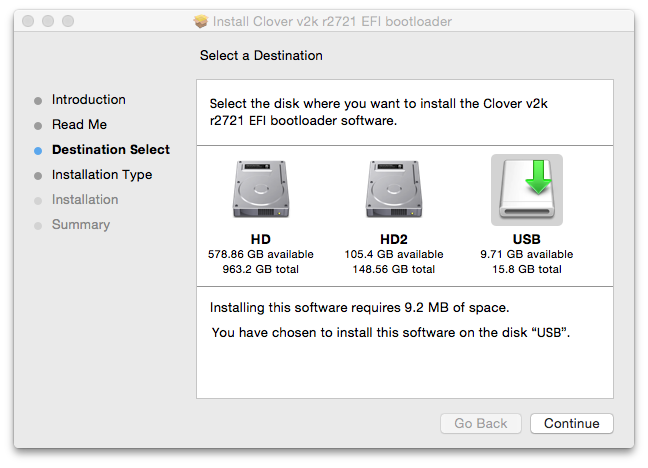 After cloning, install the new Clover revision to the USB drive (and make sure you have the same EFI folder settings in the USB Clone as on your working Install). Boot from the USB drive and ensure it is working correctly. Mount your EFI partition if it is not already- I recommend using Clover Configurator to short cut all these actions...and copy your working EFI folder to the desktop of your USB drive so it is always there for you in the steps to come. Note that both your internal NUC drives will be erased during the FD creation process. The following assumes you are using an mSATA drive and a Hard Drive on the Haswell NUC and that you are now booting from your USB bootable drive..
1. First step - partitioning your hard drive for dual boot. 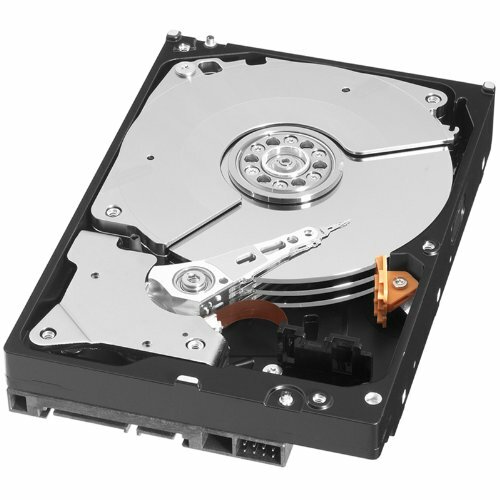 Select the mechanical Hard Drive. Click the Partition tab. Choose 2 Partitions click “Options” and select GUID. Set the first partition as Mac OS Extended (Journaled) and name “HD” choose something that is one word as it makes it a little easier in terminal operations later by not having to use special characters to represent name spaces in the command line). If you are going to be installing a second OS X partition - e.g. as a test partition - alongside your main OS X install then just set the first and second partition sizes as normal and call your second partition HD2. 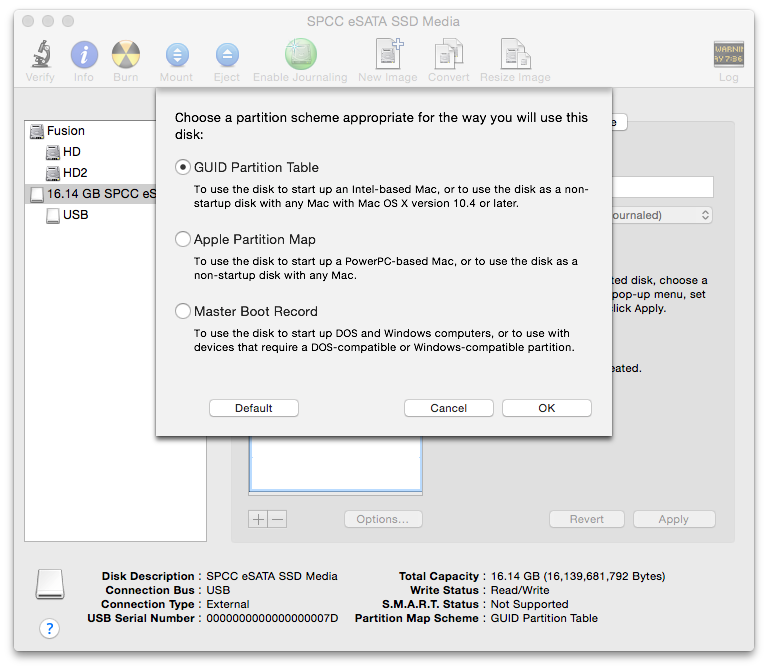 Partition your mSATA drive as a single Mac OS Extended (Journaled) partition with GUID scheme and name it mSATA. 2. In this step you are going to make a recovery partition for OS X. Using CCC open it,go up to the bar and select "Window" and from the drop down menu then open “Disk Centre”. Highlight “HD” in the left hand pane of Disk Center and then Click “Recovery HD” and go ahead and create a Recovery Partition on HD - this is one of the handy features of CCC! Do not bother with cloning as this is NOT needed at this time, just leave it at that. After quitting CCC, mount the EFI partition of mSATA using Clover Configurator (first confirm whether mSATA is disk0 or disk1 in diskutility and then mount either disk0s1 - probable - or disk1s1 as appropriate) and when the EFI partition mounts, copy over your known working EFI folder to replace the one in mSATA and then shut down. Alternatively - if you do not want to use Clover Configurator - you could simply use the Clover installer package to do a fresh install of Clover to the mSATA drive (and then once the installer mounts the EFI partition at the end you can drag across the config.plist, kexts and ACPI folders etc as you would for the "Standard Installation" method described earlier). 3A. If you are intending to install Windows on your second partition then: (a) Shut down your Haswell NUC. (b) Open up the case and remove the mSATA drive - yes, I mean it!!! (c) plug in your Windows 8 USB stick installer and start up the machine - it will automatically start from the installer. When you get to the install options make sure you go for a Custom install and then go to the advanced settings and choose to install on the Free Space you left earlier. The installer should automatically then format this area and do everything it needs - including all the usual restarting etc. 3B. If you are intending to use HD2 for a second OS X install then just go to step 4 (no need to take apart your NUC). 4. On reboot make sure to press F2 on start up to then go into Boot options and set your mSATA as first boot drive. This will verify that the bootloader is working fine and then once in the Clover menu select USB again. The above command creates “Fusion” from the partitions mSATA and HD. Terminal does its stuff and outputs a long UUID number at the end - select and copy this long UUID string. (Note: replace <FG UUID> by pasting in the long UUID string you copied above). After completion of the operation you should see now both a new mounted volume called MacintoshHD alongside "HD2" OR (if you installed Windows) alongside “Untitled”. Simply use CCC now to Clone your OS X to MacintoshHD. If you installed Windows alongside OS X then you are now done. If you took the other route to leave HD2 as an OS X formatted partition then you can now go ahead and use that partition as desired. Also, now all the messing around with terminal is finished you can simply right click on "MacintoshHD" and rename is "Macintosh HD" or whatever else you want if you prefer that! DISCLAIMER:The above procedures are by no means the only way to do what I did, they simply happen to be my preferred way. I am happy to help and advise, but if you lose data, this is not my fault (!). Please always keep a bootable copy of your install on USB so that if (when) things go wrong you can get back to where you started. Good luck! **HWMonitor is part of Hwsensors package that you can get an update from here: http://hwsensors.com please note that the normal installation package installs FakeSMC.kext and any needed plugins [ACPISensors.kext, GPUSensors.kext, LPCSensors.kext, CPUSensors.kext] to system/library/extensions. I prefer to put all of these kexts into efi/clover/kexts/10.9 and that is why I have for the Haswell NUC essentials folder included the necessary components as individual elements. In future, if you update HWsensors using an HWsensors package file, please remember to re-locate the kexts to the Efi/clover/kexts/10.9 folder. As expected, OS X Yosemite public beta is now available for download. The public beta is available to the first million users who have signed up for OS X Beta program. The build number is 14A299l, which is newer build compared to OS X Yosemite Preview 4 build (Build number – 14A298i) that was released earlier in the week. You can download the beta from the Mac App Store. Sign up for the OS X Beta Program if you haven’t already. Sign in to the OS X Beta Program website, then scroll down and click the Get OS X Yosemite Redemption code button. You will be taken to another webpage. Here click the Download button below, the Mac App Store will open with your redemption code already entered. In the Mac App Store click the Redeem button to start your download and follow the on screen instructions to install OS X Yosemite beta. As always, let us know how it goes in the comments. Last year apple radically changed the look of Apple's their mobile operating system with iOS 7. John Ive who has been the lead designer behind many of Apple's designs. Lets take a look at some of the changes. You can expect a number of changes with Apple's latest addition of OS X. One major change you will see is the dock. The new dock has improved the design of the icons. the new dock, as well as other UI improvements lessens the UI fragmentation between Apple's Operating Systems. What are your thoughts about the up coming changes coming to mac this fall? Let us know in the comments below. This is a baseline build for anyone who just wants to browse the internet, stream video and use basic applications. 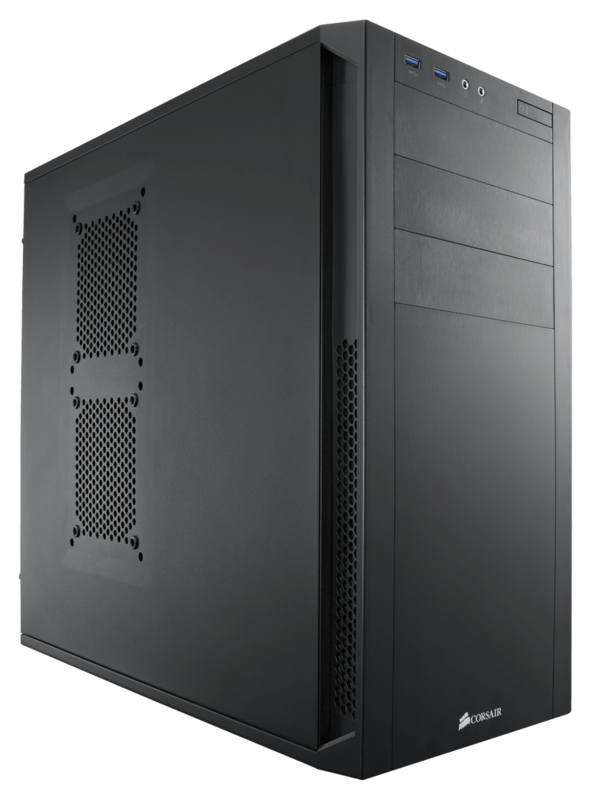 It is also very upgradable, and you can easily add a faster processor or discrete graphics card later. This build is excellent for anyone who needs a bit more power. I can more effectively multitask and potentially handle some very light gaming. This build is designed for someone who wants to game and overclock a bit without spending into 4 digits. This build is designed for those who want to develop on OSX. This build is designed for someone who wants to play the latest and greatest games on full quality. It is overclockable, and has an extra drive for dual booting Windows. This build is very similar to the high end gaming one, but it has a bit more CPU power and components more suited to video production. This will be a list of components that we recommend for compatibility with OS X. Please note that we do not have the money to test this hardware, and it is best to get a second opinion before purchasing anything for use with OS X. An i3 processor is the best choice if you plan on using your computer for web, email, streaming media and other light usage. 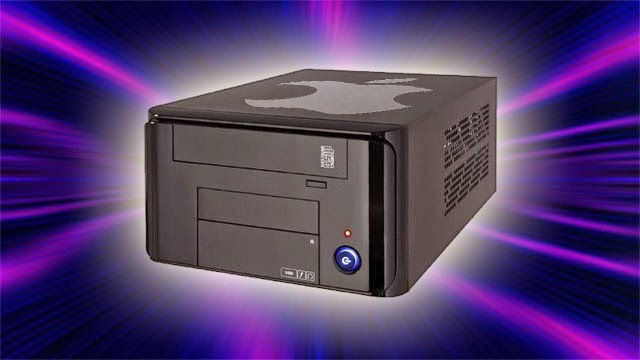 An i5 processor is best for users who want a bit more power out of their machines. i5′s are recommended for gaming machines. 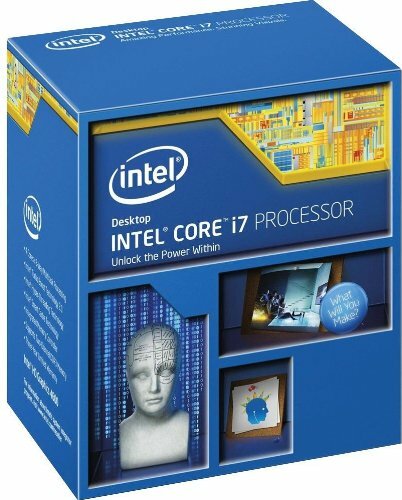 An intel core i7 is recommended for content creation machines and workstations as well as heavy gamers who wish to play the latest games while recording. While OS X can function on motherboards without UEFI BIOS, it is much easier with UEFI. We recommend Asus and Gigabyte boards. The prefix number ‘z87′ or ‘h87′ refers to the chipset on the motherboard. A z87 board is required for overclocking as is a K model processor. 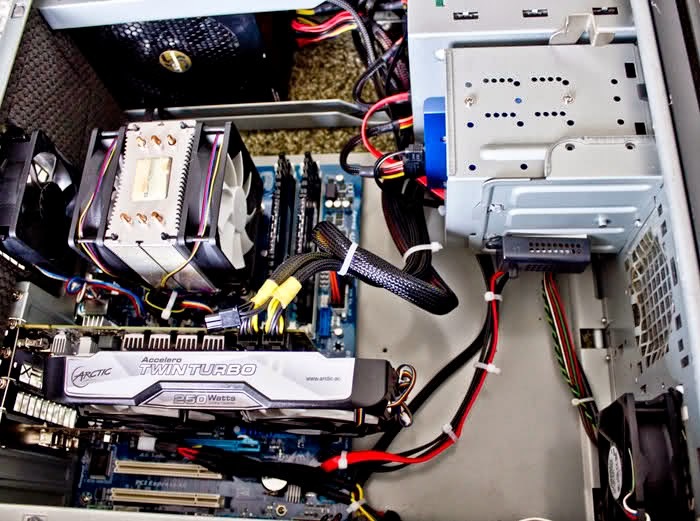 H87 and b85 are targeted more at everyday computing; they cannot be overclocked, but are generally less expensive. Asus UEFI cannot legacy boot to GUID partition tables. This does not matter when using Clover with UEFI, but it is the reason some people report not being able to boot from their HDD’s. The latest unlocked Asus boards (z87) do not contain locked MSR’s so the Kernel PM patch is not required. Gigabyte motherboards are pretty much the standard for hackintoshing. They have unlocked MSR’s on all chipsets and generally have no issues. Gigabyte boards are recommended for anyone with limited experience. 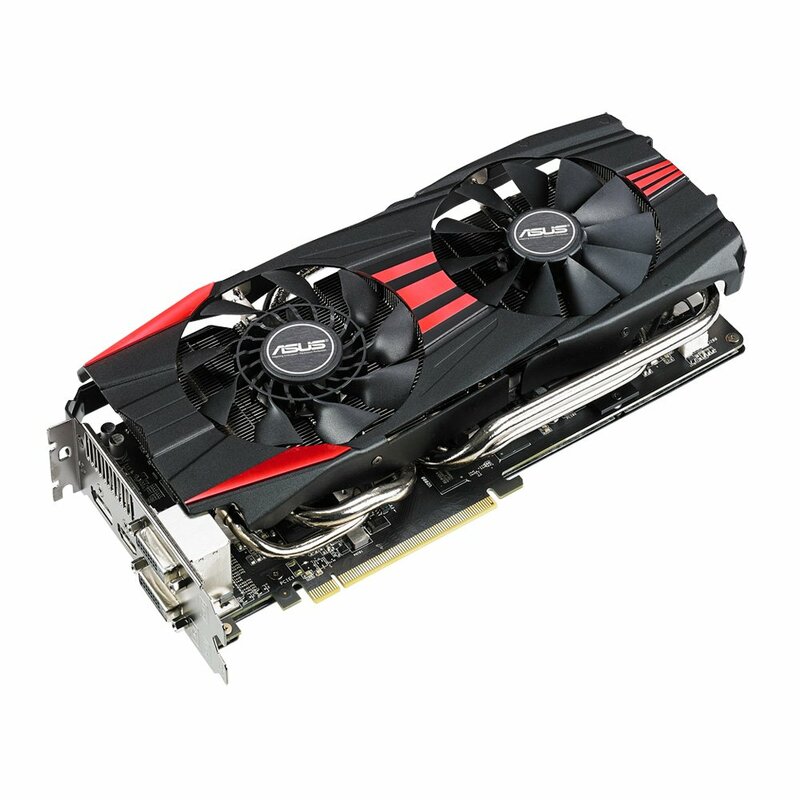 Your integrated graphics card will work for basic usage, but if you plan on gaming or video editing you will want to purchase a discrete graphics card. For a hackintosh you can use either an Nvidia or ATI card. Apple has used both in their machines over the years, but Nvidia cards are more likely to work OOB. 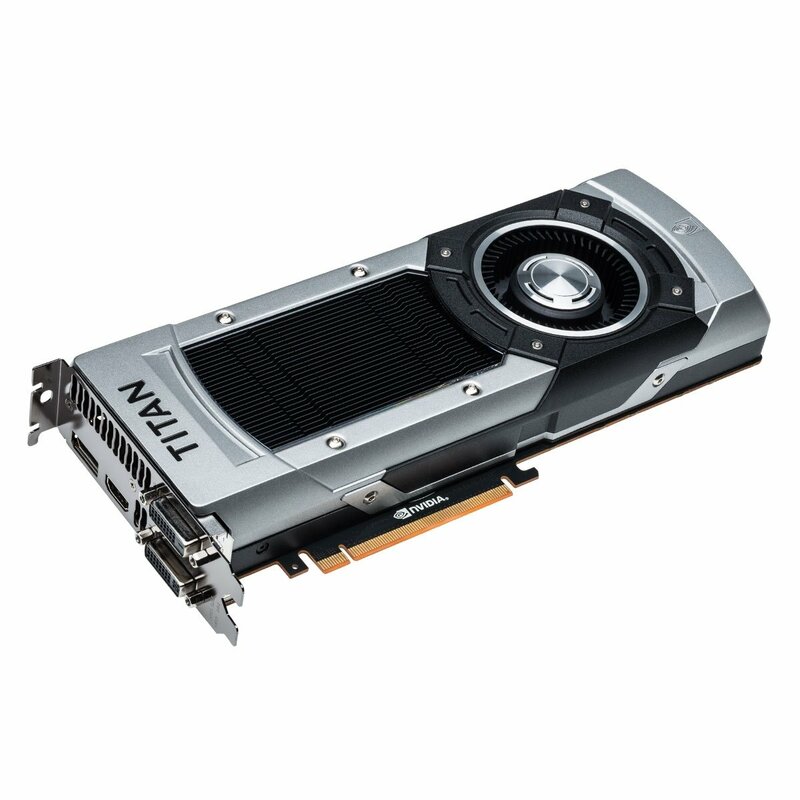 Much like gigabyte, the 6xx and some of the 7xx Nvidia cards will work nearly OOB in OS X. They are recommended for beginners. ATI radeon cards by AMD are generally not as easy to install as Nvidia cards, but you can still get them working. The 6xxx series can work nearly OOB, but the 7xxx series may need some extra work to get full functionality. Slice (The lead Clover dev) has made some guides at Insanelymac so check them out if you have issues. The R9 2xx requires some very advanced work, but can work in OS X. Here you’ve got a bit more freedom. Generally speaking, any ram compatible with your motherboard will work just fine with OS X. 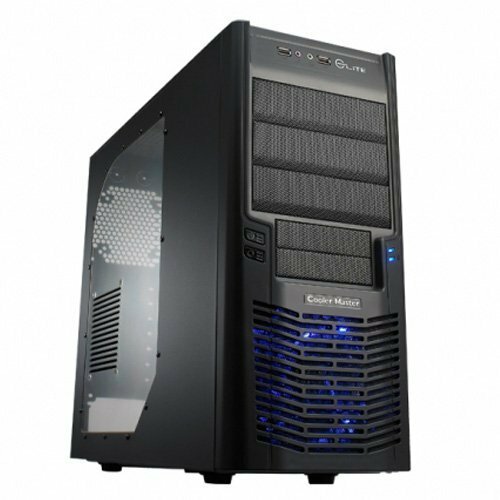 We recommend you get at least 4GB for the most basic machines 8GB for gaming and 16GB for audio and video production. The ram listed here is pretty standard desktop 1600Mhz, DDR3 ram that should work with any of the motherboards listed, but double check the specs before you buy anything. These drives will store all your data. If you are building anything but a baseline machine, you should consider getting an SSD for you operating system and apps. There are really no restrictions on what drives you can use so long as they are compatible with the rest of your build. I recommend Western Digital HDD’s; they have worked very well in my machine. There are 3 lines. WD Blue which are the baseline budget drives. WD Green is low energy consumption, but slightly slower than blue (these are great backup drives). 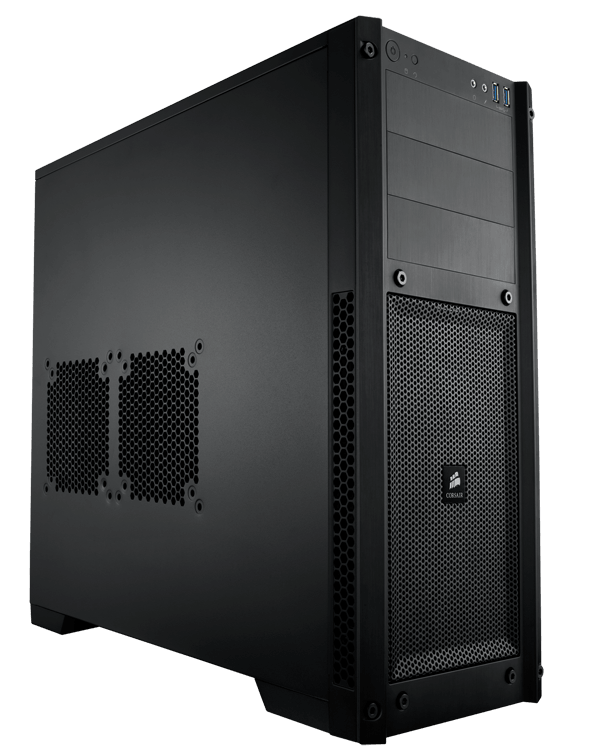 WD Black is the fastest and the best choice for systems drives. There are also WD Red drives designed for Network Attached Storage (NAS); they are not recommended for internal machine storage. I recommend Sandisks for your Hackintosh. They are known to be some of the most stable SSDs on the market. Just be sure you enable TRIM post install. This unit will power your devices. There are no special PSU requirements for a hackintosh. Just make sure you have enough power for your devices and any expansion you may need to do. 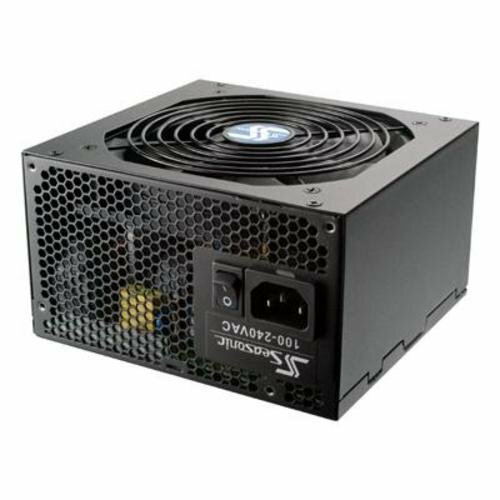 Input your build into PCpartpicker and it will tell you how much wattage you need. 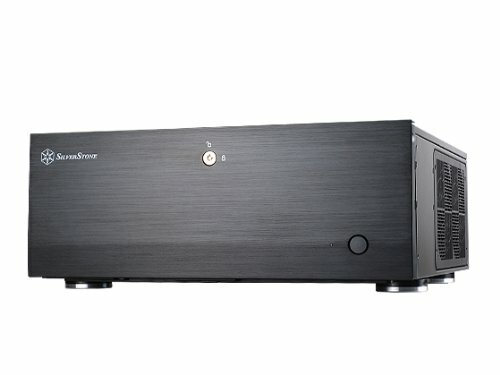 I recommend Seasonic s12ii/m12 PSUs because they are the same design and quality as Corsairs. These PSU’s come with cables detached. You can simply add in a cable for each device you need to add. This design leaves fewer spare cables in your case. All cabling will be built into the PSU. OS X supports a very limited number of wi-fi chips, and due to the rapidly changing market many cards that are compatible are no longer in production. 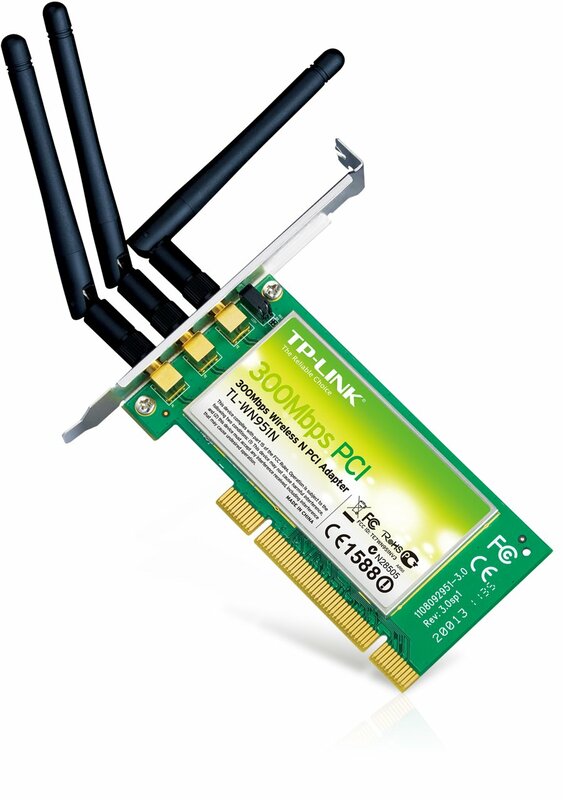 TP-LINK TL-WDN4800 This card works out of the box in OS X. TP-LINK TL-WN951N This card is cheaper, but requires a patched kext. See Hackintosh Wifi for more options are laptop wi-fi cards. Your choice of case is completely up to you. I’m just going to recommend some that I personally think look cool. 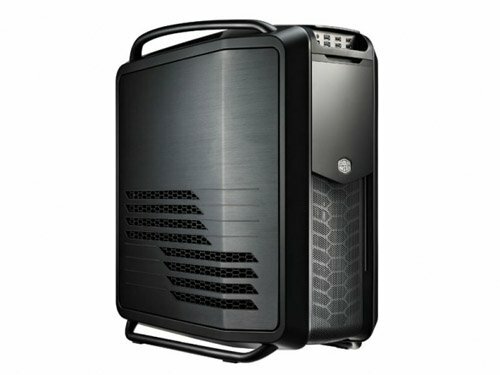 You really only need to spend about $40-50 on a good case, but if you really want an epic looking build you can shell out some more for a high end case. Make sure a case is compatible with your motherboard size as well as the number of PCI devices, hard drives and CD drives you plan on using. Some cases here are listed as silent. These cases include sound damping materials and you’ll probably want to go with one of them if you are working with audio or just have have your computer in your bedroom. These are compact cases designed for mITX motherboards. These cases will work with any motherboard ATX and smaller. 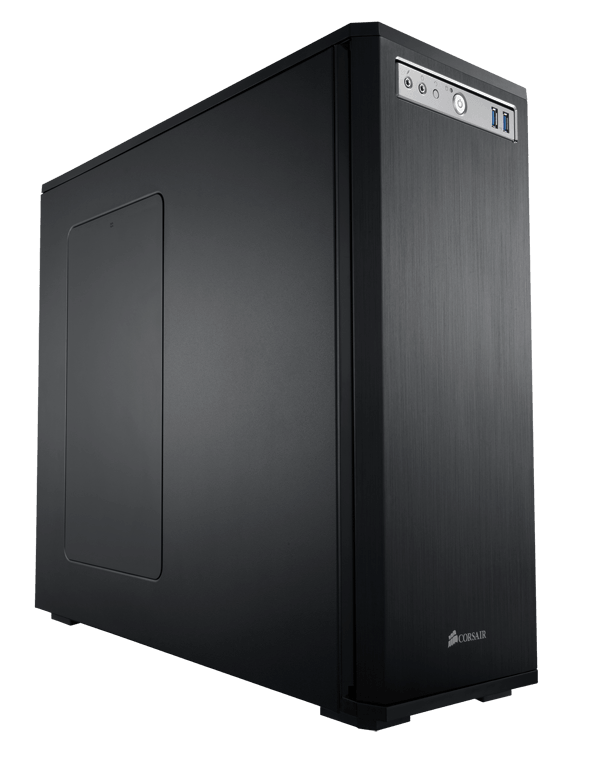 They are the standard towers, and unless you need a massive amount of space you should be go with one of these. 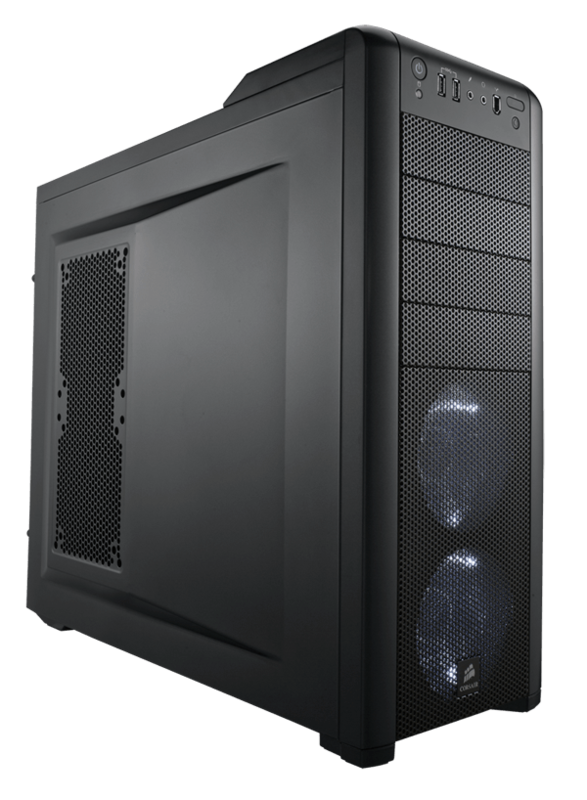 These massive monoliths are perfect for studio builds or anyone looking for insane amounts of drives and expandability. Most apple peripherals work fine with hackintoshes as well as many other components.